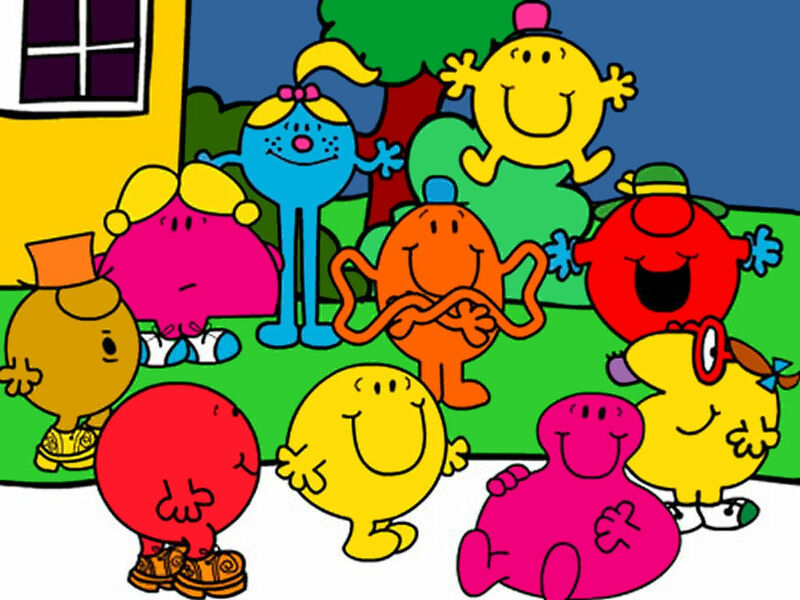 Did you used to like the Mr Men? I did. Or at least I belong to that generation of people that believes itself to have been ‘brought up’ on the Mr Men. Given the age the books are aimed at, I shouldn’t wonder that I stopped being actively interested in them, if I ever was at all, once I reached school. Which probably means that I didn’t actually ever read them myself. They were more likely to have been read to me by my parents. I found this interesting. The level of outrage surprised me; but I guess people feel extremely attached to things they hold dear from their childhood. I now watch the ‘all new’ Mr Men show with my son, who loves it – and admit to a small pang of something (disappointment, resignation, betrayal?) at how different its treatment first seemed to the memory of Roger Hargreaves’ original books and episodes. But the important bit here is ‘memory of’. If you’d asked me for details, I couldn’t have told you much beyond a few names, some details of the drawing, and at a push Arthur Lowe’s narration. For some, however, the sense of nostalgia wrought by the Specsavers ads, by the Mr Men, by memory, is incredibly powerful, and personal, however accurate or authentic to their own experience. There’s something here, I think, about how things that are made exist ultimately not in the mind of those who created them, but in the imagination of those who use them. Things (ideas, experiences, and yes, brands) are largely in the eye of the beholder. But how does this work? Now, you’ll think I’m mad, but I’m pretty sure we can learn something from the whole Mr Men story, about how brands and ideas operate once they’re released by their creators. After all, although we remember those drawings as pretty simple, it’s a pretty major interpretative leap for a child of 3 or 4 to connect that round form (denoting both face and body at the same time) with any person that makes up their own real world. Thought of that way, it becomes fascinating to think about how children, and therefore all of us, engage with stuff that comes our way. Roger Hargreaves was an ad man. He created his characters because his ambition was to write cartoon strips, and he’d hit a time in his life when he wanted to spend time with his kids. His son once asked him what a tickle looked like (which is brilliant in itself, I think), and it inspired Hargreaves to invent these people that encapsulated human characteristics. Something for everyone, there, then. Since the late 19th century, new childrens’ books have often arrived into the world not just as one-offs, but as episodes suggesting a continued series. They use repetitive formats, familiar lay-outs, a network of characters who can fade in and out of view (as Beatrix Potter did); they can feature logos and stand-out imagery in the way Enid Blyton did with Noddy. This means the child being read to instantly understands where she is. She can feel at home, but secure enough to explore the suggested map of the fictional world. It means she can return again and again to the world, but not always have to re-tread the same path. Things get a bit meta on occasion, too. At the end of Mr Small, the eponymous hero is introduced to a man who “writes stories for children”. The writer offers Mr Small a job, and even suggests he might write a story about our protagonist, who protests that no-one would find that interesting. “Oh I don’t know about that” says the writer, before addressing the reader directly: “You did, didn’t you?”. Without warning, a character in the story reverts to being the narrator, but for the first time talks in the second person. It’s hardly likely that we ever receive anything at face value after a start in life like this. Remember the gnashing, snarling, horrible monsters of Where The Wild Things Are? They’re smiling! Check out Winnie The Pooh and his friends, all trying to affect Grown-Up Status with their Important Words, ironically started with Capital Letters. And Peter Pan? Well, a book about childhood, epitomised by a feral innocent whose loyalty ultimately becomes an annoyance to the girl how did grow up, written by a man whose love for children attracted doubtful rumours throughout his life…what could be weird about that? We live in different times now, of course. As well as meta, we get inter-textuality. Children rarely come to a book these days without the capacity to interact with it in some other form: films, TV shows, theatre adaptations, toys, posters, duvets, etc. The typical, and understandable reaction from parents is to worry about the corrosive effect of this over-exposure to something manufactured. The fear that it amounts, in effect, to the commodification of the imagination. However, Michael Rosen (always brilliant in this area) suggests that the ‘things’ themselves (the pen, the socks, the merchandise) don’t intrinsically represent anything bad, or indeed good. The important factor instead is how children interact with those things, and how they make the connections between them. The main question is, are they being creative with the space between things; or are they passive, and at risk of being dominated by them from all angles? I bet most of us would agree that the former is preferable. That children can get all of that from some books and a selection of extraneous merchandise is pretty awesome, I think. And yet I wonder, though, how most of us in marketing would answer the question if it was being asked of our own efforts in engaging supposedly more sophisticated adults, and with a bucketload more money that Roger Hargreaves ever had.